With Summer weather on its way there also comes with it the risk of suffering heat injury during strenuous exercise; be that during a hike in the hills or during an organised event like the Oxfam 100km Charity Walk. There are three types of heat injury (Heat stroke, heat exhaustion and hyponatraemia) that one must be aware of and it is essential to know the difference between the three because the emergency action and medical treatments are different and if you, or the medics get it wrong, things can go from bad to much worse! This is most common during short, sharp exertion in warm or hot conditions, such as may be experienced during a five kilometer fun run, or when struggling up a very steep slope under a heavy back pack. If dehydration is present, it is mild. Heat stroke is most commonly suffered at the beginning of Summer in the less conditioned participants and in those who have had little recent acclimatisation to warm conditions. High humidity may be an additional factor because humidity reduces the effectiveness of evaporative cooling from sweating. Extremely high core temperature of up to 41°C. Hot, red, dry skin (Little or no sweating). Someone with heat stroke has stopped sweating, due to a failure in his or her heat control system. 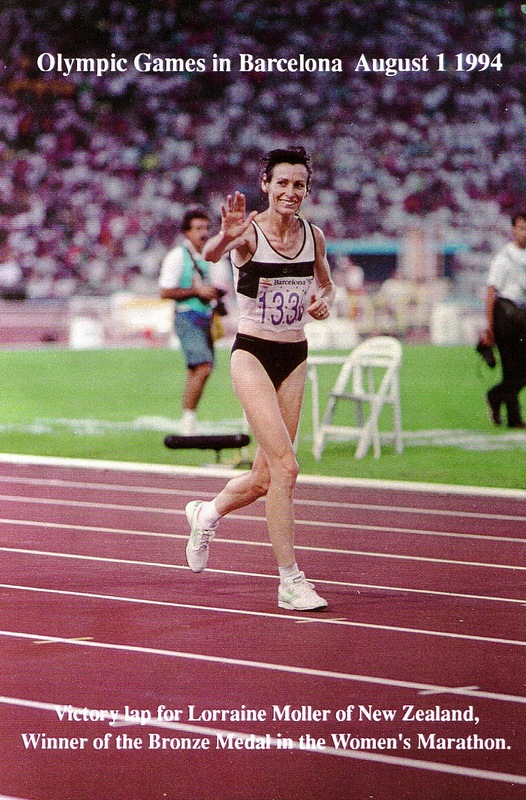 Speeding up to “suicidal” pace, if in a race. Confusion, aggression, strange behaviour such as trying to keep running even while lying on their backs. Possible loss of consciousness, or falling in and out of consciousness. If unconscious, failure to recover consciousness when laid down and with legs propped up. High core temperatures damage the internal organs, especially the brain. Any fluid loss can also produce dangerously low blood pressure. Most people who are killed by heat stroke die when their heart stops pumping effectively (circulatory failure). Even people who survive are likely to have permanent brain damage if their core temperature has been over 40.6°C for more than an hour or two. High temperatures damage delicate cell materials and structures, such as proteins (think of cooking egg white). High core temperatures speed enzyme activity in the cells, causing an internal equivalent to a nuclear melt down – more and more heat is produced even after exercise has ceased. Effective emergency action to reduce core temperatures is critically important. Stop the victim from exercising. A person suffering heat stroke may aggressively resist assistance, even if lying semi-conscious on the ground and may continue to try to run/walk or even crawl through the gorse undergrowth (I have had to deal with this during an incident at a mountain bike race). Place in the “Recovery Position”. Call emergency services – Heat stroke is life-threatening – They need expert medical care without delay. Get the victim out of the sun; but keep in a breeze if possible. Cool by pouring water over the torso and limbs and fan vigorously for convective cooling. If available, immerse their torso in an ice bath. Only give small amounts of liquid at a time and only if conscious in case of vomiting. Once initially stabilised, they must be transported the quickest way possible to hospital – Like by helicopter. Lorraine: Very dehydrated; but prepared! usually experienced towards the end of long, moderately intense exercise, when the combination of exhaustion, dehydration and heat may bring about collapse. Moderately high core temperature (the temperature of the body's internal organs, best measured with a rectal thermometer) of up to 39°C. A person suffering from heat exhaustion will usually be sweating profusely in an attempt to get rid of excess heat. Drastic drop off of pace, if in a race. Possible fainting, but can be revived by laying down and propping up the legs. The consequences of heat exhaustion are usually much less severe than heat stroke or hyponatraemia and it generally does not constitute a medical emergency. The reason heat exhaustion is not a dire medical emergency is the loss of fluid and depletion of energy (hypoglycaemia) prevents the body's metabolism from from going into “hyper-drive” or “melt-down”. The victim merely shuts down to the point where they can no longer proceed. There is a potential for kidney damage. The most frequently suffered consequence is very sore leg muscles for several days – more so than what would be expected from delayed onset muscle soreness, post exercise. The most immediate consequence of heat exhaustion is the person will grind to an exhausted halt as the event proceeds and may even faint. Fainting can be very disconcerting to those about them because it may appear they are suffering a heart attack, stroke or epilepsy. Slipping into a chilled state (hypothermia) within minutes of ceasing exercise is a real risk and often the case. This is because the exhausted person is unable to generate enough body heat that is sufficient to maintain core temperature. Recovery is usually very quick, once the person has rehydrated and well on the way to topping up their depleted energy stores. Stop the person exercising and have them lie down, in the shade, with legs propped up so that blood flows to the brain. Cool the person by fanning (usually not necessary to chill with water). Rehydrate with a mix of sugary drinks (fruit juice, sweetened tea) and electrolytes (a simple and effective electrolyte solution is water with a ¼ teaspoon of pink salt per liter. Keep warm: It may be necessary to cool the person initially, but be aware that a person suffering heat exhaustion may quickly slip into a chilled sate, so have blankets, sleeping bag, jackets, a hat and other warm clothing at the ready. Avoid hot spas and baths until fully hydrated and re-energised otherwise the person is liable to pass out due to already low blood pressure plummeting even further. Do not stand around later on at the prize-giving, for example. If one must attend, then be seated or even sit or lie on the floor and take care when standing up quickly because the blood pressure may be very low and fainting is a possibility. Hyponatraemia is now the leading killer during organised events such as marathons, ultra-marathons, adventure racing and Iron Man triathlons. In my opinion, hyponatraemia is the consequence of excessive influence of numerous water and sports drinks companies in popular sports media and with event sponsorship. These companies have deep pockets and they want participants to drink more product – not less with the result that the need for “hydration” during exercise has been promoted to the point of hysteria. The voices of reason have been “drowned” in the promotional deluge. Once virtually an unknown condition, it is now commonplace. Researchers found, for instance, that 13% of the athletes who finished the 2002 Boston Marathon were in a clinically hyponatraemic condition. Tim Noakes' 2012 book "Waterlogged" addresses this phenomenon. Hyponatraemia occurs as a result of a proportional excess of water relative to the plasma sodium (salt level in the blood). I call it “Soggy Body Syndrome” in which the body becomes full of water. Unfortunately, this swelling also occurs in the brain. With no room to expand in the skull, the brain is progressively compressed ultimately resulting in brain death. Needless to say, all suspected cases of hyponatraemia must be treated as a medical emergency. Hyponatraemia is rare among the front runners in events like the marathon. This due to them being unable to drink more than a few cup-fulls while running at pace and their finishing in short time. Those most at risk are the “back markers” and walkers who have plenty of time to drink large amounts of water and are exercising at a rate that allows them to hold it down, due to less sloshing about in the tummy! Excessive fluid consumption before and during and longer finishing times are the primary risk factors for developing this condition. Vomiting may be the only clinical sign differentiating hyponatraemia from other conditions that induce exercise-associated collapse. Weight gain (If pre-event weighing has been done) during the event is another clue of hyponatraemia possibly being present. The natural response of a distressed athlete and those administering care, is drink even more water because they think the problem is to do with dehydration. Unfortunately, water alone will increase the problem of hyponatraemia. At the most extreme an athlete may experience seizures, coma, or death. The best way for an athlete to avoid such problems is to train in similar environmental conditions to what is anticipated on the day and to drink only what is required to replace what fluid is lost – Not more. Very, very humid, no water stops and still 15 miles to go! 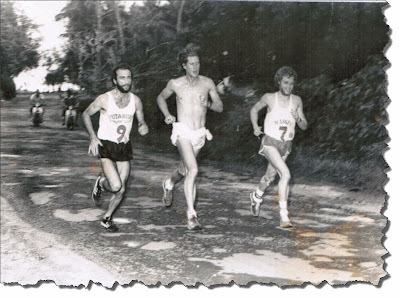 Rarotonga in 1988: The good old days of “Big Hair”, beards and no official water stations! 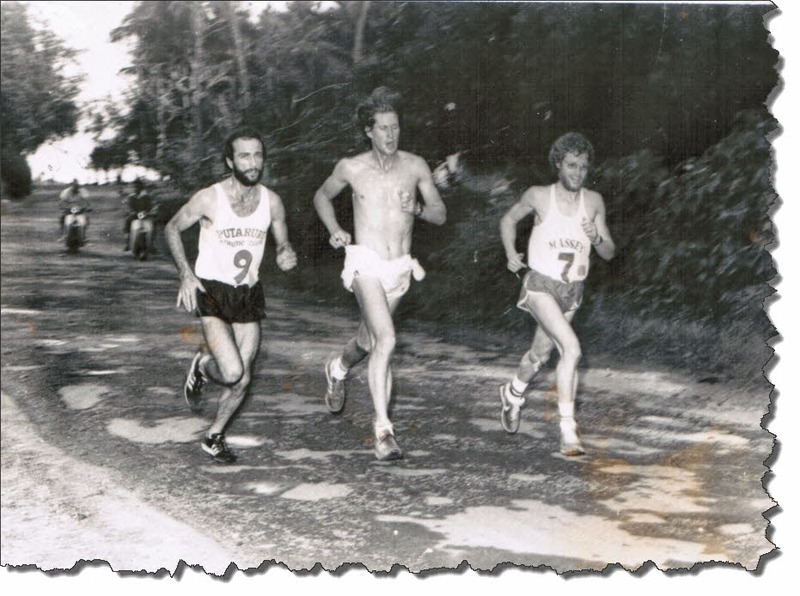 The race featured World mile record holder, John Walker, and reigning New Zealand Marathon Champion, Graham Struthers (That's me in the “Putaruru” singlet). I came second, not so much due to ability and more to do with having spent several weeks cunningly heat acclimatising during a long, cold New Zealand winter in preparation for the tropical heat and humidity of the Cook Islands. Get really good at listening to your body: Drink according to the first subtle sensations of thirst, rather than by a fixed hydration rule. A good way to gauge how accurate you are at listening to your body signals is to weigh yourself immediately before and after exercise. Take account of what is drunk during the exercise. A kilo lost or gained is equivalent to one liter of water gained or lost. Adjust drinking during the next exercise session accordingly. Do this often during training so that you get a good feel for it. If you are peeing with “normal” regularity, then you are probably keeping well hydrated. If you are constantly running off to the toilet, including all hours of the night, and peeing large volumes, you are probably drinking too much. If you have constant headaches, there is the possibility that you are over-hydrating. Use a sodium containing sports drinks during long distance, high intensity events (more than 60-90 minutes long). I think the best is a bottle of water that is lightly salted with a pink multi-mineral salt, rather than refined salt which provides just one of the dozens of different minerals that are lost in sweat. Fruit juice can be added to provide carbohydrate energy. Increase daily salt intake at least several days prior to competition (except for those with hypertension). Salt food generously with a pink multi-mineral salt, rather than refined salt. Try not to drink more then you sweat and pee out. Before, during and after weighing is a the best way to tell. A good rule of thumb when doing strenuous exercise for longer than an hour is to drink about 1 cup of fluid every 20 minutes. Stop the person exercising and have them lie down, semi-reclining, in the shade.. Shift into the Recovery Position, if unconscious or if feeling nauseous (They may vomit without warning). Call emergency services: If the person is suffering hyponatraemia, they require urgent medical assistance, including intravenous electrolyte solution to restore sodium balance. They have to get to hospital the fastest way possible - Like by helicopter. If conscious, give a palatable salty drink (If it is too salty, the person will feel even more nauseous and may vomit). If they feel feel more nauseous after drinking a salted liquid, give a cup or two of plain water to dilute what is in the tummy. A simple and effective electrolyte solution is water with a ¼ to level teaspoon of pink salt per liter (Taste it to make sure it is palatable before administering it). Keep warm: It may be necessary to cool the person initially, but be aware that a person suffering hyponatraemia may quickly slip into a chilled state. Heat injury during prolonged, intense exercise, be it a marathon, or a hike in the hills, is a hazard that is easily avoided; but easily suffered. Prevention consists of acclimatising for the anticipate conditions and a sensible approach to hydration – not too much and not too little. In the end, it comes down to listening to your body's subtle signals of distress, be it thirst, or getting too hot, for example, and then responding accordingly. The only marathon I ever pulled out of was half way through the Otago Championships, held at the end of a long Southern Winter. A hot North-Westerly wind was blowing and competitors dropped like flies as the race proceeded. Come the halfway point, I was still upright, running freely and well-placed! Being familiar with the signs and symptoms of heat stroke, it soon dawned upon me that I was quickly running into trouble: I was nearly sprinting with still another 20 kilometers to go, I had stopped sweating profusely and I felt as if I was in a euphoric dream – Chariots of Fire – Here I come! I saw sense and stopped – Best decision in a long time, for sure!